There are a number of passive detectors detailed elsewhere on this website. This page concentrates on active device detectors. These are used to detect Morse (CW) and Single Side Band (SSB). A number of circuits were tested for conversion gain and the results shown below. Distortion was assessed from the scope display. 1a. Pentode with filament/cathode injection. 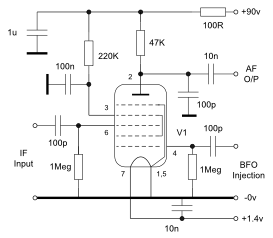 This circuit shows high gain and low distortion with similar results from three different valves. An equivalent circuit using the DC90 single triode was built but the audio output distortion on the positive peak could not be reduced to a reasonable level so the circuit is not shown. All versions were tested at 3.4MHz. All voltages are peak to peak. 1b. Heptode with direct BFO injection to grid 1. 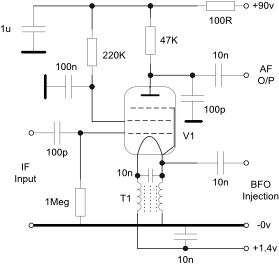 This circuit shows lower average gain than the above circuit with no visible distortion. The onset of detection is visible at a BFO injection level of about 100mV pk-pk and the conversion gain does not increase significantly above an injection level of 500mV pk-pk. The 1R5 is an equivalent to the DK91. All signal voltages are peak to peak.